SHEFFIELD council took “no appropriate action” on complaints made over 13 years that a residential social worker was abusing teenagers and children as young as six, an inquiry reported yesterday. The worker, Malcolm Thompson, was promoted despite aggressive and manipulative behaviour, the inquiry said. He was often protected from complaints and at least two youngsters were persuaded or coerced to withdraw allegations against him. Of 16 youngsters known to have made complaints between 1976 and 1989, only one had an allegation referred to the police by Sheffield’s family and community services department, the independent inquiry found. “The department failed to co-ordinate the various signs of trouble and failed to act responsibly,” said the report’s authors, Sheila Poupard and Malcolm Jordan. Young people and other staff had suffered greatly. 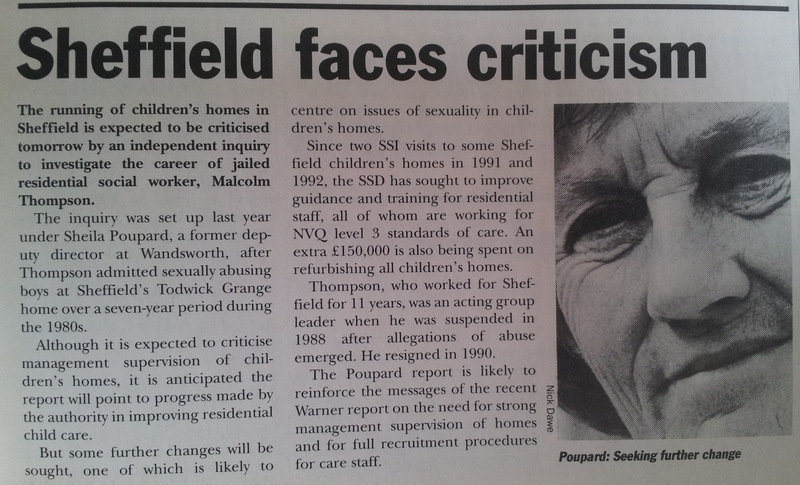 Mr Thompson, who worked for Sheffield council from 1977 to 1990 – though he was suspended from 1988 – was jailed for six years last summer after pleading guilty to four specimen charges of indecent assault against youngsters who had been living at the Todwick Grange children’s home. The inquiry was initiated by Martin Manby, Sheffield’s social services director since 1990, who yesterday announced action on the 20 recommendations made by Ms Poupard, former deputy social services director of Wandsworth, south London, and Mr Jordan, former deputy social services director of Lancashire. The report follows criticisms of conditions in Sheffield’s 17 children’s homes by the Government’s Social Services Inspectorate, which checked some of them in 1991, and again in 1992, at Mr Manby’s request. Mr Manby said the authority was implementing a fresh strategy for children’s residential care. He stressed that much had already been achieved in the 4 1/2 years since Mr Thompson’s suspension and that the inspectorate had found no evidence of malpractice. However, Mr Manby accepted that yesterday’s report further identified “many of the features needed in a high-quality, safe children’s residential service”. The report says Mr Thompson’s initial appointment was faulty and no formal appraisal of his abilities took place. Managers failed to deal with his behavioural problems and he was promoted regardless, arriving at Todwick Grange in 1981 and becoming an acting group leader in 1987. – An independent special school head teacher jailed for 12 years for abusing boys in his care had been “easily able to fool the system”, a report published yesterday concludes. Ralph Morris, who had been head of the Castle Hill school in Ludlow, Shropshire, was imprisoned in 1991. The report, written by Shropshire social services as a guide to avoiding or dealing with similar cases, says “his image was accepted without question and his impressive list of qualifications never verified”.